Prospects who set up a meeting with EyeMed received an Amazon Alexa as a thank you for their time. “If marketers are not using direct mail, they’re missing out on a huge potential channel to remain relevant,” particularly as part of a larger account based marketing strategy, notes Naomi David, marketing manager, demand gen, at Walker Sands. 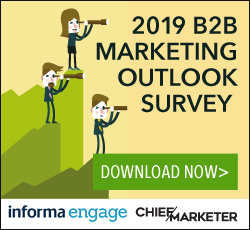 Direct mail can be very effective as part of an integrated strategy, in combination with email and other touches to warm B2B prospects before sales contacts. Smaller campaigns to more highly targeted lists are often the way to go, says David, because of the high costs of paper and postage. EyeMed—a division of Luxottica Group, the parent company of eyewear brands like Ray-Ban, Oakley, Pearle Vision and Lenscrafters—has over 52 million members across the U.S. who belong to group benefit plans. Direct mail figures into the company’s plan both for prospecting and as part of account based marketing programs with large clients and insurance brokers, to encourage them to promote the provider to their customers, says Kosinski. Digital retargeting is often done first, prior to direct mail, to help verify the lead before it goes into a drip program to nurture the customer. Direct mail is always part of an integrated campaign. While postcards might be used early in the buying cycle to help qualify a lead, dimensional mailers designed to intrigue prospects are more commonly used. EyeMed works with Milwaukee-area B2B agency Responsory to create its direct mail campaigns. Often, the mailers include a small premium, with the promise of a larger offer if the prospect takes a meeting. 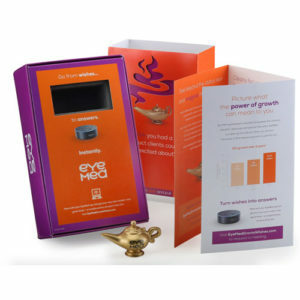 For example, a toy magic lamp was sent in one campaign. Those who set up a meeting received an Amazon Alexa for their time. The Alexa came installed with an EyeMed app to carry on the branding. Direct mail ROI is tied to the overall response rate of a campaign, and how many meetings a piece generated for the sales team. If someone responds to direct mail, they are often more likely to ultimately do business with EyeMed. In the past four years, it isn’t uncommon for the company to hit response rates as high 45 percent with its direct mail campaigns. Kosinski notes that to engage prospects, direct mail offers need to be intriguing and engaging. Because so few brands are effectively utilizing direct mail today, the channel presents a great opportunity for marketers who get it right.